In a similar fashion to my AS3 Graphing Classes, my MathML parser was created out of necessity. I was working on a project that had to display some equations, but drawing them out manually seemed a bit over the top. I originally looked to see if anything was already available on the net but had no luck. Considering that the only other option was to create each equation manually, I decided to try and write my own MathML parser. After a bit of research and playing around I came up with a set of classes that worked in a recursive manner to generate the equation. The example file below demonstrates how the parser works. For anyone who finds themselves in need of some MathML ActionScript classes, I have moved them onto GitHub. 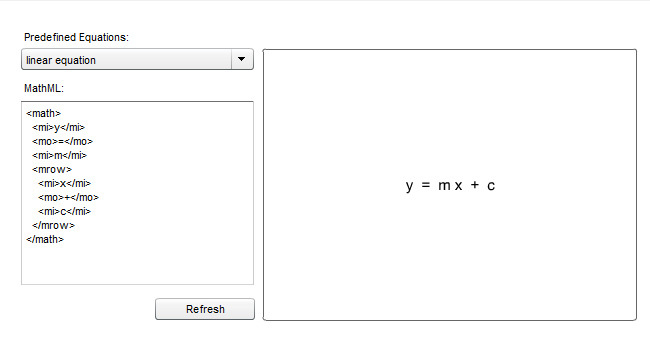 On the side note, there is a program called Amaya that can be used to generate MathML in a pretty easy to use interface. You can download it for free from here. Thank you so much, this is really what I need…even if I still don’t know how to adapt it to my code ( I already have a XML in which I would like to put the formulas). I would be grateful if you could share to me a complete example in how to use the MathML classes. I am a nearby.